Home/Corporates, General, Investors, Silicon Valley, Startup Europe Partnership, Startups/European Dual Companies: A Scaleup Migration? Launched yesterday in London, in conjunction with the event “Dual Companies: How and Why European Scaleups Expand to the U.S.,” the latest SEP Report realized by Mind the Bridge with the support of international law firm Wilson Sonsini Goodrich & Rosati. The Report provides key new data on European “dual companies”, i.e. startups formed in Europe that move their headquarters abroad, while maintaining a strong operational presence (such as R&D activities) in their home country. Notably, the report highlights that approximately 1 out of 7 (14%) European scaleups moves its headquarters and part of its value chain abroad. The U.S. is the most frequent destination for European dual companies (82%). Among them, more than half move to Silicon Valley. Only 14% of the dual companies surveyed moved their headquarters to another European country. In those instances, the UK—specifically London—was the most frequent destination. International expansion impacts European scaleups’ abilities to raise capital: dual companies raise on average 30% more capital than companies that follow a purely domestic path. Access to late-stage capital clearly emerges as a key driver of U.S. expansion, while European investors are reported to be focused primarily on seed and early-stage funding. The lack of a homogenous internal market in Europe also emerges as a significant challenge. None of the European scaleups surveyed selected Israel as a business expansion destination. Despite its reputation as a global technology hotspot, Israel does not appear to be easily accessible for European startups. 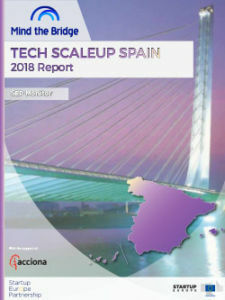 According to new research released today by the Startup Europe Partnership (SEP), 14 percent of European scaleups have adopted a “dual model”, meaning that on average, one out of seven scaleups has moved its headquarters abroad since the initial phases of its lifecycle, while maintaining a strong operational presence in its home country. The dual model is a widespread and viable way to foster growth, given that such companies raise approximately 30% more capital than scaleups that follow a domestic funding path. These are some of the main highlights that emerged from the latest SEP Report presented yesterday in London in conjunction with the event, “Dual Companies: How and Why European Scaleups Expand to the U.S.,” which was organized by Mind the Bridge and international law firm Wilson Sonsini Goodrich & Rosati. This SEP Report expands on research conducted with the financial support of the European Commission Directorate General for Research & Innovation. In terms of capital raised, dual companies raised $10.6B—17% of the total amount of capital raised by European scaleups ($58B). This means an average of $18M for dual companies versus $14M for domestic scaleups. It should be noted that there are often regulatory restrictions limiting incentives and funding to startups adopting the dual model, particularly when they are identified as subsidiaries of foreign companies. This creates a paradox for governments increasingly committed to supporting and investing resources into the startup ecosystem, as dual companies seem to have the best chance of scaling up and producing growth and local employment. In terms of numbers and capital raised, the dual company phenomenon seems not to be homogeneously widespread across Europe. Generally speaking, established ecosystems, including Germany, France, and the UK, show percentages of dual companies in line with or slightly below the European average at 14% (10%, 12%, and 13% respectively). For capital raised, dual companies fall significantly below the average of 17% (Germany and UK with 7% and 13% respectively, and France slightly above with 20%). Conversely, emerging scaleup ecosystems and small countries are consistently driven by dual companies: Iceland leads the ranks of dual companies on total number of scaleups (31%), followed by Norway (25%), Denmark (24%), and Finland (21%). The Nordics together with Poland raised more than double (36%) the European average. In particular, Portugal shows a percentage of capital raised more than 2.5x higher than the European average. Also, Italy and Spain register a higher ratio (1.4x and 1.3x respectively). These numbers suggest that companies should consider adopting the dual model approach when domestic funding and infrastructure are insufficient. Among the 467 dual companies tracked, 383 (82%) companies moved their headquarters to the U.S. and 42 companies moved to the UK. The remaining 42 companies spread out among other countries around the world. Even less of a surprise, Silicon Valley was the most frequent destination chosen by European dual companies. Just above 40% of dual companies relocated to Silicon Valley, while 20% chose New York. In Europe, all of the 42 companies that moved to the UK chose London. A similar magnetic effect occured in Spain, where most companies chose Barcelona or Madrid. Unexpectedly, no European scaleup relocated to Israel, according to the research. Despite its reputation as a global technology hotspot, Israel does not appear to be easily accessible for European startup companies. Dual scaleups from Southern and Eastern Europe seem to be more attracted to Silicon Valley (50% and 63% respectively); scaleups from France and Germany are almost equally distributed between San Francisco (33%) and New York (22%); while UK and Nordic scaleups have a stronger preference for Silicon Valley (43%). London attracts 20% of the Northern European scaleups. “Dual Companies that moved to the U.S. attracted significantly more capital than their London counterparts, with $7B in funding (82% of total) versus around $1.2B – commented the Coordinators of the Report – Still not a surprise to see that dual companies that relocated to the Silicon Valley got the biggest slice of the pie, securing 39% of the total capital made available to European dual companies, New York follows, London ranks third”. The research reinforces the idea that scaleups following the “dual model” are among the top-performing high-tech companies in Europe: 21 out of the 86 European “Scalers” are dual companies (24%) and raised $4B (16% of the total). Aside from the quantitative analysis, more than 20 interviews with dual company founders and executives were conducted, and they shed light on the main motivations for international relocation. It emerges that funding is the main driver to U.S. relocation, followed by the opportunity to access a larger market and early customers. European investors (including but not limited to business angels, institutional investors, and VCs) are reported to be mainly focused on seed and early-stage funding, with London and Berlin slowly shifting towards more later-stage funding options. Access to larger IPO opportunities (scaleups that decide to go public in the U.S. raise about 6x more capital than scaleups that IPO in Europe). Proximity to strategic partners and potential acquirers, chances of gaining traction, and producing revenue are among the other most valuable reasons to relocate to U.S. While American companies gain advantages because of their homogenous market, European companies are hindered by their fragmented market. On the other hand, the lack of later-stage capital in Europe, the small domestic market, red tape, high taxation, language barriers, the difficulty to go public for tech startups, and the lack of an single EU market are considered the most important obstacles to scale up in Europe. Despite these obstacles, operations and high-value activities remain in Europe, since European companies show a difficulty to access the best talent in the U.S. One of the serious advantages that European startups have over the U.S. is that in Europe, founders can hire top-notch engineers for the price of one junior Bay Area engineer. For the top 100 European Dual Companies, download the Report for free.